The internet is full of advice for writers. We’ve all read blogs, websites, and books about what to do and what not to do. The cardinal sins of writing, tips and tricks to make you a better writer, surefire marketing techniques to get people to read your book. It seems as if everyone has a magic box of tricks that will make you the best writer in the world. After a while this box full of advice becomes too heavy and a writer can get bogged down with all the information that’s out there. I’m sure we’ve all felt that way. I’m not here to give you more advice about writing. You’ve heard enough from every possible person under the sun who claims to be an expert on the topic. But what I will do is give you some insights to help you clean out the clutter and focus on what matters. 1. You cannot go into the writing business expecting to make a ton of money or become famous. That is the wrong frame of mind to have. Unless you are John Grisham, J.K. Rowling, or Danielle Steele, that prospect is pretty unlikely. But even those authors had to navigate through landmines to get where they are today. Writers write because it’s what they love to do. You have to love to write, first and foremost. 2. When you write, write for yourself. No matter how famous a writer is or how many New York Times best sellers they’ve written, not everyone is going to like their writing. I admit, there are authors out there who are considered world class that I don’t particularly like. Not because they’re bad writers, simply because I can’t get into their books. Then there are other writers no one has ever heard of that I love. It’s all a matter of personal taste. People like what they like, and your novel isn’t going to change their opinion if they don’t like that type of book. You will never please the masses, so stop trying. Ultimately the only person who has to be pleased with your work is you. Stay true to yourself. 3. Take advice from people who matter. With all the advice and tricks out there, I will be more likely to read Stephen King’s book about writing than a college English major’s two cents worth. Take advice from people who know what they’re talking about. They’ve been down the road you’re on. They’ve walked in your shoes. Might be a good idea to at least hear what they have to say. 4. Take all negative feedback with a grain of salt. Everyone has an opinion about something, and the reality of life is that some people are never happy unless they have something to complain about. Seriously? You have nothing better to do with your time than go on Amazon and write a bad review for a set of dishes because they were hot when you took them out of the microwave? Did you think about using a pot holder? Anyway, off my tangent now. Negative feedback is going to happen. Again, you won’t please everyone. But you can turn the negative into a positive and use it to improve your craft. Some people are quick to judge, but have they ever come up with a story idea, sat down and poured sweat and bled ink over a manuscript for months or years on end, then exposed themselves to the world by throwing their story out for the public to read? Most can’t stake claim to that herculean task. I’m not saying to ignore negative feedback, just don’t let it consume you or deter you from doing what you love. Turn that negative into a positive and keep writing. 5. Which brings me to my next point. Keep writing, and don’t let anyone stop you. 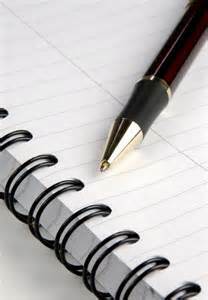 Writers improve by writing. No one said your debut novel was going to be the most fabulous piece of literary work in the history of the world. In fact, very few debut novels fall into that category. Your debut novel is your way of telling your story to people who choose to read it. Your first novel is a learning experience. Use it to work the kinks out. You can only get better with time. 6. Relax and live life. Being a writer is awesome. We see the world differently because we experience things through writer’s eyes. We analyze body language, notice small details in facial expressions, watch people’s actions (which is fascinating, by the way), and listen intently to conversations. We take in every scent and sound of our surroundings and discover a story from ordinary things. The funny thing about this is most people don’t realize we do this, yet we do it on a daily basis. Do yourself a favor, clean out the clutter and get away from the keyboard for a while. Go out and do stuff. Spend time with your family. Listen to music. Tour a museum. Play Frisbee at the park. Walk the dog. Take photographs of nature. See a movie or a Broadway musical. Most importantly, have fun doing it. You never know, an experience you have could be your main character’s the next big adventure. In movies, the production crew, actors, directors, etc…often go on location to film so the setting of the story is genuine and real. When they can’t go on location, they research the area and create a set, trying to make it as realistic as possible. As a writer, I find it easier to write about things I am familiar with. Writing a death scene becomes a less trying task after experiencing loss firsthand. Writing my characters’ emotions flows smoothly when I’ve experienced those emotions myself. Since I am around children daily and have children of my own, writing from a child or teenager’s point of view is much more genuine. I grew up in California and the Pacific Northwest so I am able to easily write scenes in these locations because I’ve lived there. You get my point. But there are times when firsthand experiences aren’t always possible. This is when research and going on location plays a vital role. I once read a quote that said, “Even when writers aren’t writing, they’re thinking about writing.” This became more true than I realized when I went on vacation with my family last summer. 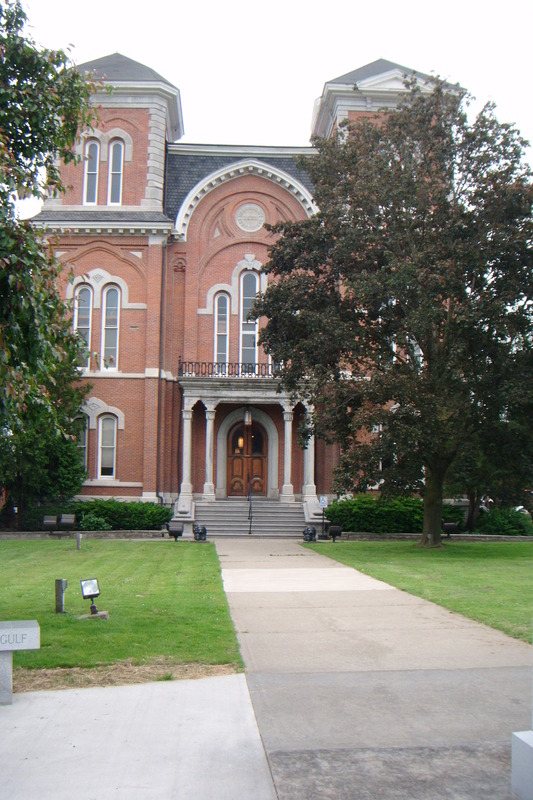 One of the books in my series partially takes place in Owego, a small town in Tioga County, New York. 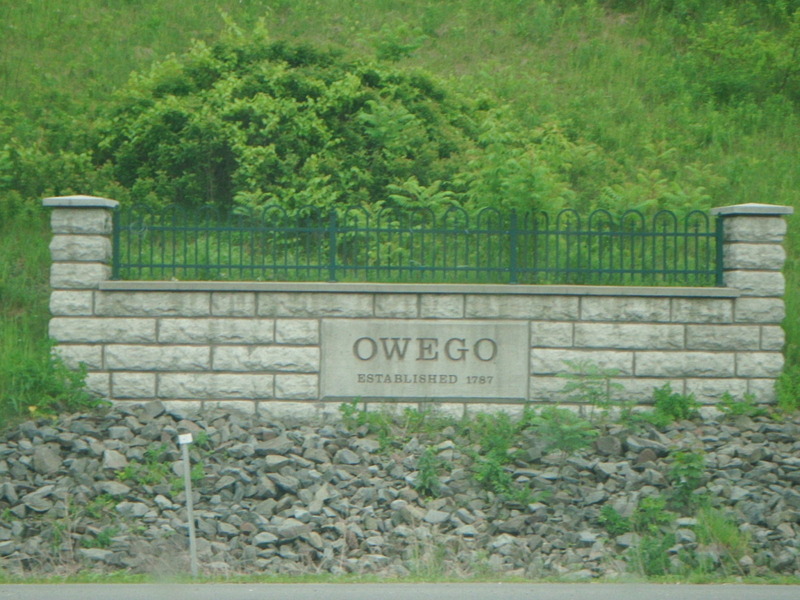 At the time, I had never been to Owego. My husband, however, grew up in that part of the country. While I listened to his stories, I took notes. I also perused through pictures and read up on this particular place via the internet. I had the research part taken care of, but I wasn’t satisfied with that. I wanted to see it for myself–that firsthand experience. Since we were heading that direction for vacation anyway, and my husband knew I wanted to see it, we made a side stop in Owego. 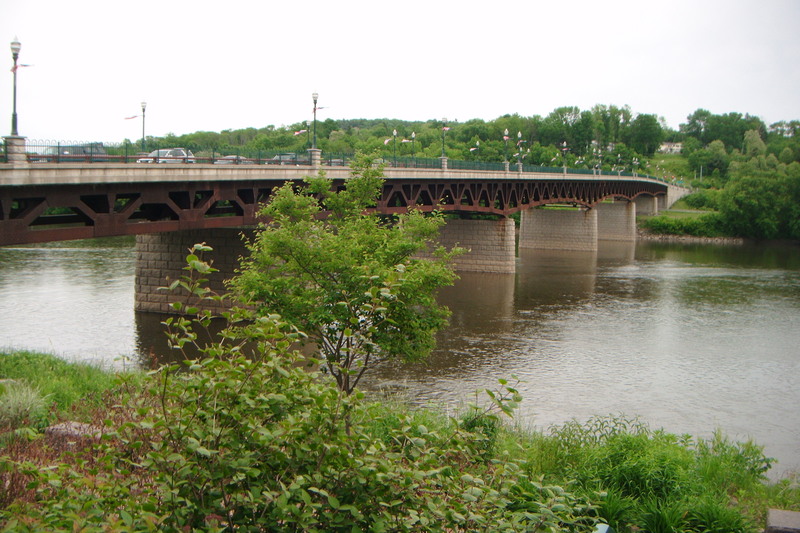 Owego is located on the Susquehanna River. It’s a cool little village with a lot of history attached to it. Old historic houses dating back to the 1700’s, the old county courthouse, several monuments, and a bridge that connects the town to the highway on the other side. I was interested in the scenery, the history, the culture, and the overall feel of the town, not only as a tourist but also as a writer. Even though I wasn’t writing at that moment, you can bet your life I was thinking about writing. We drove around various neighborhoods, walked around the main street, looked at monuments, and explored the riverwalk. I took pictures, carefully observed the locals, and took in every scent and sound. The moment we returned to the hotel, I wrote down everything, making special notes about particular things I saw that I wanted to include in my book. The entire on location experience was unforgettable. I saw things and places I’d never seen before, was able to get the firsthand experience I needed, spent some quality time with my family, and it was fun. 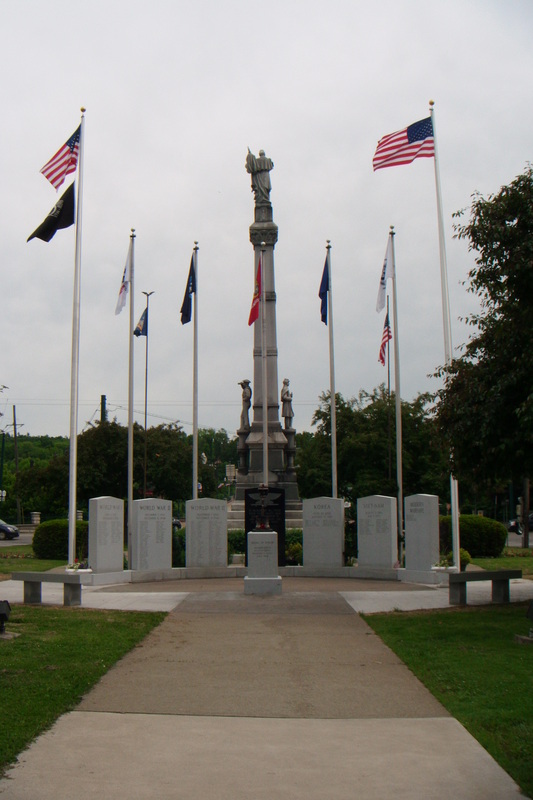 I hope to return to Owego and visit other cities and towns of interest in the near future. Editing is going to be the death of me. I am thoroughly convinced of this. I don’t even know how many hours I’ve spent editing my novel, over and over again, and every time I look at it, it seems as if I’ve missed something, a comma here, a period there. And recently I finished yet another copy edit to fix typos that were originally overlooked. Even though I had an editor help with the whole editing and proofreading process, it amazes me how many errors I still found. I guess when you read through a manuscript that many times, the words start to jumble together in your head after a while. Being a writer, I am never satisfied with my work. Then again, maybe that’s just me. I always seem to find something wrong with my writing. Eventually there comes a time when I need to tell myself to stop editing and just submit the darn thing. Being a writer is not just about writing. 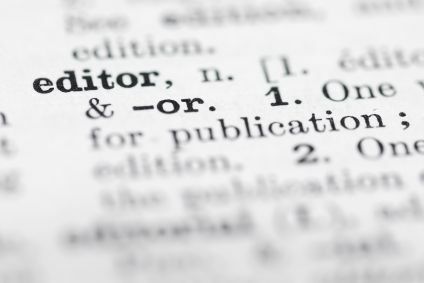 You have to play the role of reader, editor, proofreader, critic, and marketing specialist. Marketing is a nemesis all on its own. I’ll get into that later. But by far, I think the hardest and most stressful part of writing, at least for me, has been the whole editing process. Do you remember in school when you’d get a paper back with all that lovely red ink on it marking every error that your teacher wanted you to correct? The dreaded red ink! Cut this. Delete that. Move this paragraph here. It always looked like someone bled all over your paper. That’s what editing feels like. 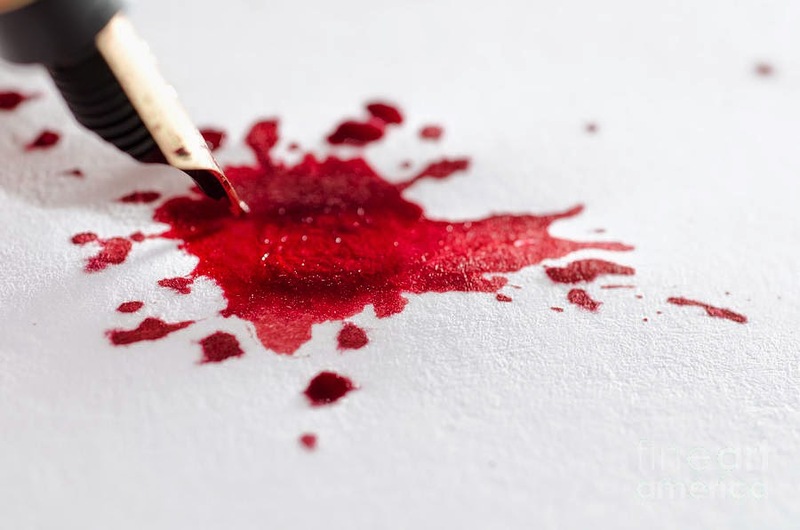 That red ink of death is what kills your characters, deletes that magnificent paragraph that you worked so hard on, and reminds you how imperfect you are. Although this process has caused me to rip out my hair on several occasions, I have learned from it. First off, editing makes a story flow smoother. It makes language consistent and brings out an author’s style. Secondly, even though that paragraph might have been the most poetic thing I’ve ever written, I have to admit that the scene is much better without it. Finally, editing has taught me to be critical of my work. If it isn’t absolutely necessary in the story, cut it. If the sentence doesn’t flow, fix it. And if it just flat out sounds bad, get rid of it. One piece of advice I was given, that has actually been really helpful, is to read the manuscript from back to front to check for proofreading errors. That way you’re not reading the story, you’re simply checking for typos and grammatical errors. When I was told this, I though it was crazy, but it works. I caught many errors by following this advice. 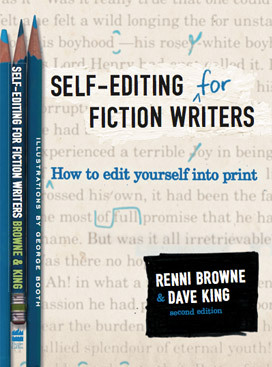 Another thing that helped me was this amazing book called Self Editing for Fiction Writers. Best investment I ever made. I happened to stumble upon it during a weekly book run to Barnes and Noble with my family. Browsing through the writing reference section, the title immediately caught my eye. I pulled it off the shelf and skimmed through it. Bingo! Just what I was looking for. Definitely a book worth reading for any writer. I highly recommend it. All in all, this whole process had been a learning experience. If I’ve learned nothing else from all of this, the one thing I will take with me is that writing, good writing, is excruciatingly hard, but if you’re serious about and dedicated to it, the end product is well worth the effort. So keep writing, celebrate those little successes, and don’t give up. All of the blood, sweat, and red ink is worth it! This was a note written on a card I received from one of my students at the end of the school year. Moments like these are the heart and soul of teaching. Touching one child. Making a difference in one child’s life makes the stress and long hours and everyday frustrations of my job worthwhile. I recently had the opportunity to teach 78 children all about writing, and let me tell you, there are some talented young writers out there. 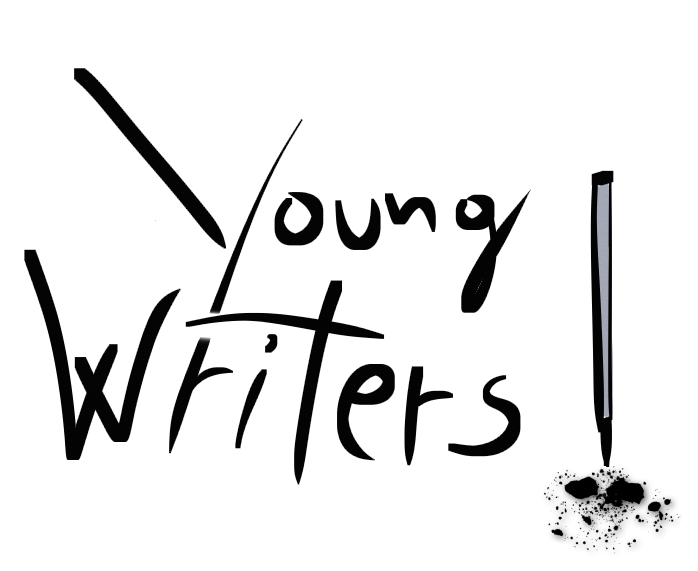 When I first announced the dreaded “Young Author’s Conference”, I heard a few cheers and saw a few smiles, but mostly I heard a lot of groans. “Miss, I never know what to write about.” “I hate writing.” “Writing hurts my hand.” Come on now, we’ve all heard this before. Most kids don’t like to write. I’m not exactly sure why this is, but when I took on this project, I was on a mission to create young writers who love to write. We discussed character development, character flaws, and character goals. I read aloud, from books they love to read, great ways to begin stories and great ways to end stories. I gave them descriptive words and phrases to help them show, not tell, and even read them examples from children’s literature of great descriptions that pull the reader right into the scene. We shared ideas on other ways to show action as well. We went over examples of dialogue and how to make it genuine and character specific. The kids received an extensive list of other words for said, other words for went, transition words, etc… We had mini-lessons on capitalization, when to separate paragraphs, proper punctuation, and how to use quotation marks. We covered pretty much all the usual writing topics and rules that we all learned in school. Lesson were kept short, no more than ten minutes a day, because I wanted the kids to spend their time writing. How can I expect them to produce a quality story if they don’t have time to write? Throughout the writing process they were encouraged to share ideas and offer creative insights with each other. Several cases of writers block were solved with this simple method. None of these writing skills were taught until after I read aloud an excerpt from the draft of the first chapter of the children’s book I am in the process of writing. All eyes and ears were glued, listening intently, especially since I told them that their teacher was the author. As teachers, we use mentor texts all the time, but it’s not every day that kids hear a mentor text written by their teacher. That first chapter, which is all I read, sparked their interest and triggered many of our writing discussions. The story concepts the kids came up with were incredible. One of my favorites was about a lizard, who works in an office and drives a car. All she wanted was a cup of coffee. After facing many obstacles in her pursuit to gain said cup of coffee, including a broken alarm clock and a police officer, she finally reaches the long line of Starbucks. Her coffee dreams are soon shattered when she shows up late for the office meeting, where coffee is not allowed. That particular story had a comic element to it and seriously made me laugh. On a more serious note, I had another student write about a character who, after a near drowning experience, wanted to overcome his fear of water. So he goes on an adventure with his friends. While boating down a river of rapids, which terrifies him, the boat tips over. Eventually he saves all of his friends by fishing them out of the raging river. The stories I read were amazingly detailed and made me want to dig out my pompoms and cheer their character on. At the conclusion of this two-month long “Young Author’s Conference” experience, kids who didn’t like to write were proudly showing their stories to everyone, including all the teachers across the hall. They read them, or at least part of them, aloud to their peers and, even though most kids throw old assignments in the trash as soon as grades are handed back, my students kept these. They gently placed them in their folders, some even hugged their stories, and proudly took them home. “Miss, this was so much fun. Can we do it again?” “My story is awesome! I’m gonna write another one.” “I love to write!” The words and excitement coming from the kids spoke volumes to me as a teacher and as a writer. Creating young writers who love to write. Mission accomplished I think. I love the rain. I grew up in an area of the United States where it rains almost daily. Now that I’m in Texas, rain is a rare treat. We’ve received more rain this year than we have in many years, so much rain that many cities have been devastated by floods. Despite this, I don’t think I’ve ever seen Texas so green. It’s beautiful. It happens to be raining again today. I love the sound of rain. 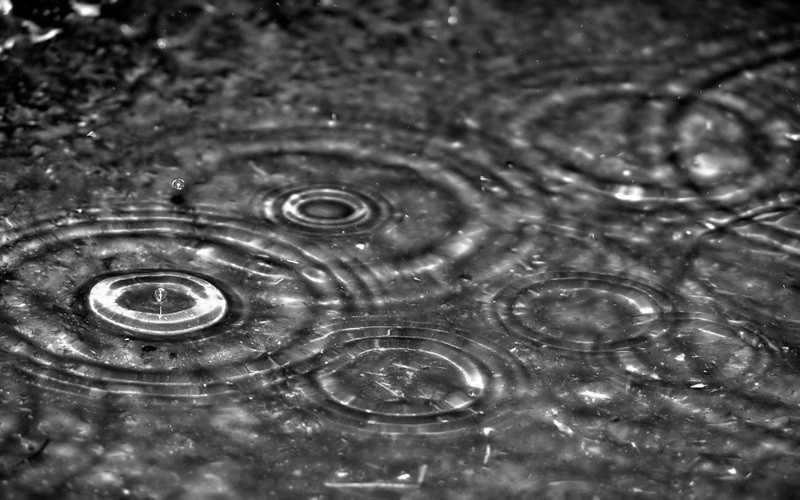 The sound of rain not only relaxes the mind, but it can inspire creativity as well. Art, photography, music, poetry, theatre, literature — rain has provided inspiration for many artists. Today I’d like to share some rain-inspired works that I love. 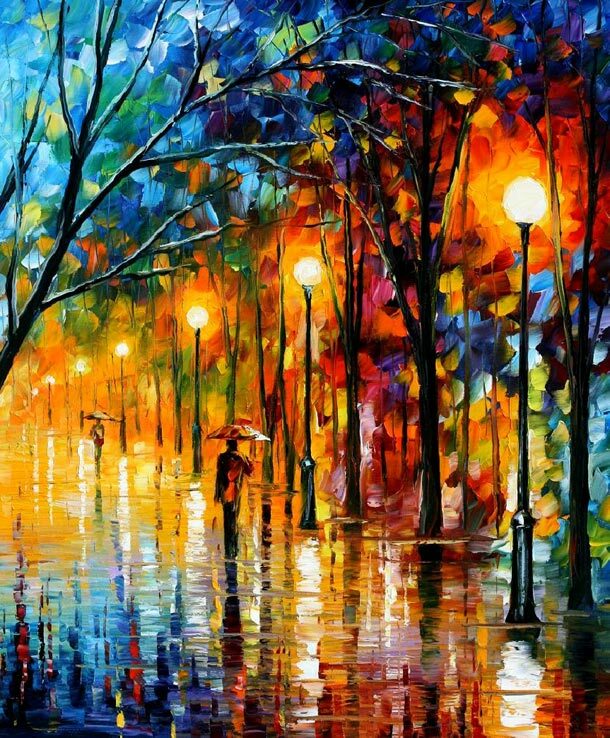 A painting by Belorussian painter Leonid Afremov. This awesome photography shot is called Rain Again. One of my favorite musicals is Singin’ in Rain, starring Gene Kelly, Donald O’Connor, and Debbie Reynolds. 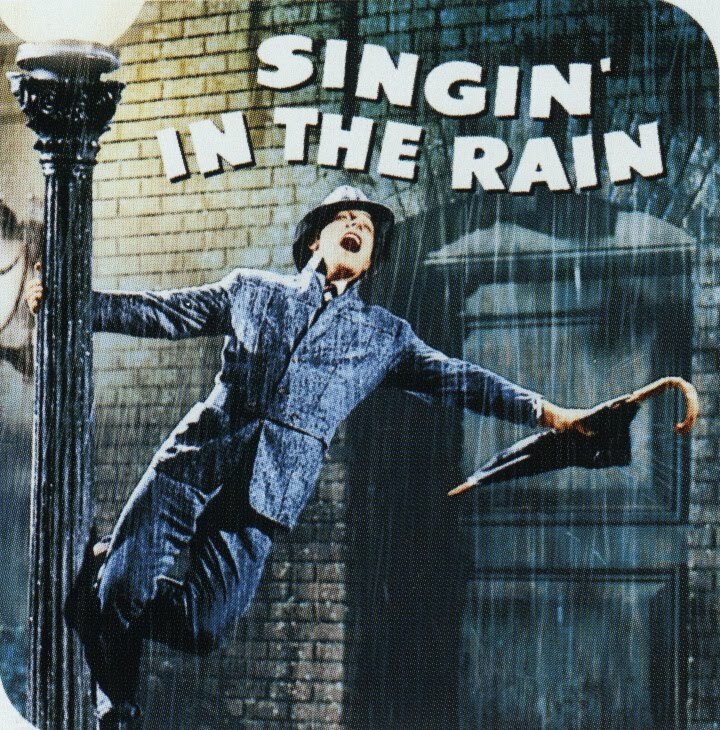 See Gene Kelly Perform the song “Singin’ in the Rain” here. Rain has a purpose. It brings life by providing water for flowers and plants. Rain fills reservoirs, which provides clean drinking water. It keeps lakes and rivers at capacity, which not only benefits fish, but also gives us a place to go waterskiing, swimming, or enjoy other recreational water activities. Rain supplies puddles for kids to splash in and a water source for animals to drink from. Rain cleanses the Earth, relaxes the mind, and cools the air. I love rain. The lake ripples as boats float by. The clouds pour raindrops from the sky. Cleanse in holy water before you pray. But frozen as ice, it cools down burns. And on a hot day from a sprinkler it bursts. Delicate snowflakes fall from the sky. In summer the water balloons sail by. Then helps me relax on sauna rocks. Water is life, and water is nice. “How do you do it all?” I can’t even begin to tell you how many times friends, family members, and colleagues have asked me that question. And there really isn’t a definitive answer other than blood, sweat, and tears. Well, maybe not the blood part, except for that time I had a paper cut. But then again, if bleeding ink counts, then blood does apply. Real writers work ridiculously hard. I never realized how hard until I became a part of the author melting pot. Sweating over deadlines, crying because your editor wants to cut a scene you spent months perfecting, tearing your hair out over marketing, and coming to the realization that following your dream of becoming an author has sucked every ounce of energy from you. The entire writing, rewriting, editing, revising, polishing, publishing process is a walk in the park, except you’re not walking, you’re running with rabid dogs chasing you and the park in on fire. Ok…it’s not that bad. I’d describe it more like a marathon where you’re pouring out all of your energy and sweating like crazy hoping to reach the finish line without collapsing. The market for books and e-books is huge. 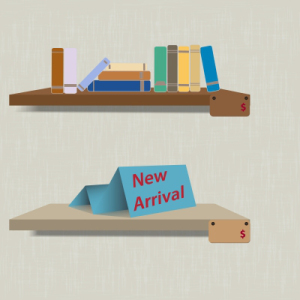 Authors of every age, with varying levels of experience ranging from big names with large-scale international profiles to indie authors no one has ever heard of, write and publish books from every genre imaginable, and all seek the same thing–to gain readers, which will hopefully lead to book sales. 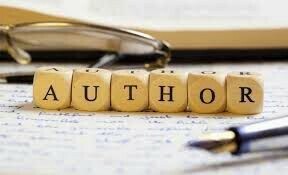 Authors participate in book signings and readings, keep up on social media, and some even conduct interviews or offer writing workshops to teach others how to write. The list goes on. All of this is challenging, but when you consider the fact that many of these authors are married, raising children, paying mortgages and car payments, and some of them even go to school or carry full time jobs when they aren’t writing (myself included), the entire writing process seems daunting. So how does a writer with a normal life do all of this? Caffeine is certainly helpful, although I don’t recommend drinking 50 cups of coffee a day. In fact, I don’t even like coffee. Tea works nicely though. 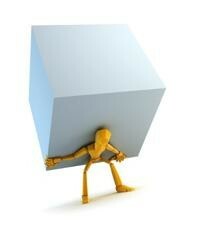 Being a writer, carrying a full time job, and raising a family definitely falls into the balancing act realm. My first priority is my family. My children are older now and don’t require my attention 24/7, but I still make sure they have what they need and make it a point to spend some quality time with them. My husband and I need time to connect as well, so we make time every night to talk. Weekends, for the most part, are family time. Housework, yard work, and taking care of our pets is a group effort. We all work together, taking ownership of the tasks at hand, so we are able to complete chores fairly quickly. This way all of us have time to pursue whatever our passions and interests are. Less sweat, less tears, and hopefully no blood. My job occupies my day, five days a week. I’m technically on the clock from 7:30 a.m. until 3:30 p.m., although I don’t recall in the 20 some years I’ve been in this profession a time when I’ve actually left work at 3:30. I’m usually in the building until at least 5:00 p.m., often later in order to avoid rush hour traffic. My profession is one that requires me to work with children all day, which, as those of you who are around children know, can be physically draining. Endless paperwork, countless meetings…I won’t get into all the details. The point is I probably work anywhere between 50 and 70 hours a week. But I’ve made it a point over the last few years to leave my work at work and not bring any of it home. If that means I stay a little later that day, then that’s what I do. Less sweat, less tears. I have, however, seen blood in my profession, including my own. My evenings, after dinner with the family, are dedicated to writing. 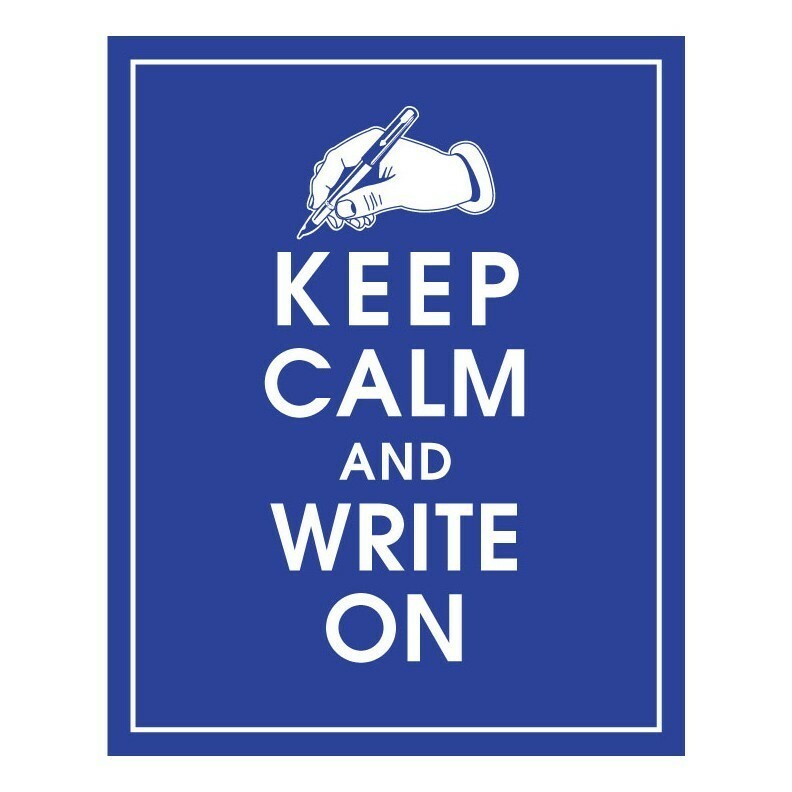 Whether it’s reading a good book by a great author, editing and revising a book I’ve written, working on a first draft of another book, or networking, etc… I’m writing. I keep a notebook and a pen in my possession at all times in case an inspiration pops into my head (which happens more often than you think it does.) I use this time to relax and unwind from my busy day. That’s what writing does for me. It’s my stress relief. No sweat. No tears, unless I’m reading or writing an emotional scene, and definitely no blood. Although I have written scenes that have blood in them. It all sounds chaotic and overwhelming, but would I have it any other way? Not on your life. Balance. Balance leads to harmony. Harmony lessens stress. Less stress means less sweat, fewer tears, and only occasional blood loss. So pursue your dream, and most importantly, take some time for yourself. Live. Laugh. Love. Read. Write. I read this on another blog and found it interesting. Thoughts on this? Before I start explaining, when I say ‘book shops’, I’m not talking about one-store indies, but chains such as Waterstones. And although it’s fairly easy to have your book displayed on a local level, it’s much harder to get your self-published book stocked nationally by such chains. And that’s what I’m going to explore here, with the help of Linton Robinson and Dave Bricker. It must be every writer’s dream, to walk into their nearest branch of Waterstones, or Barnes and Noble (if it wasn’t for the recession, digital disruption, and a whole host of other reasons, there may have been more), and see their book proudly standing, face out, in the shop’s most visible, attractive display. Or better still, the window. Just picture the scene, if you will…. Almost every writer is inspired by something, whether it be another person, music, photos, books, movies, or a number of other things. Inspiration to write doesn’t always come easily. Often times a story idea just pops into my head, and I take off with it. Other times an inspiration-seeking session is in order. As a writer, I find myself reading constantly. I read from a variety of genres and from many different authors. Books allow my imagination to run wild. Not only can a book create images in my head, but reading also allows me to see different author’s writing styles. Sometimes a phrase or particular scene from a book gets the creative juices flowing, but in all honesty, gaining inspiration isn’t why I read. I read simply because I enjoy a good book. An author can gain a lot of insights from watching people, which I do almost subconsciously now. I write realistic fiction, so I spend a lot of time watching how people react to certain events or stimuli. I strive to make my characters as real and believable as possible. Making mental notes about how people act or jotting down what they say often inspires me to write. I create scenes based on what I hear or witness people do. Although my characters are not based on real people, some of their personality traits or dialogue bits may reflect those of people I’ve come into contact with. This makes my characters real and easier to relate to. Interesting photographs grab my attention. In fact, I have a bad habit of taking pictures of interesting things during routine shopping trips or when I’m sharing lunch with my family. An example of this is when my husband, my kids, and I were eating lunch together and a framed picture on the wall called out to me. It was a photograph of a man in a black trench coat and black fedora walking down a lonely street holding hands with a woman in a black dress. It was raining outside so the woman held a black umbrella in her hand to retract the rain. The man, however, walked unsheltered, with rainwater dripping off his hat. That particular photograph had a story behind it, a story I intended to write. So I pulled out my phone and snapped a picture of it. I listen to music regularly. I don’t usually do this while I’m writing, but song lyrics often lead to a story. I’ve heard it said that music stirs up memories–memories of a particular person or event in your life, whether joyous or disheartening. I firmly believe this is true. This may seem odd to non-writers, but certain songs bring particular characters or scenes to mind. Music often inspires me to write. I place my characters in a scene and imagine a song playing in the background. The song in my head fits the scene, and my character’s actions and words could easily be a part of the lyrics. Writers are inspired by just about everything, and inspiration comes differently for every writer. Share your thoughts. What inspires you to write?